With the latest version of Rufus Software, many users started facing several types of problems they never met before. Some Windows users are telling that They're not able to boot the operating system after creating the bootable drive. So, In this article, I am going to mention some free alternatives to Rufus. Though, the problem could be different. Like, you have not selected right bootable device in the boot menu. Or, maybe your ISO file is corrupted. Also, if you're using SanDisk USB drive; then you need to know you can't use it as bootable media. SanDisk USB flash drive comes with sort of restrictions. If you don't like Rufus software, or if you think it doesn't work; then you can skip this solution part. And, check out Rufus Alternatives mentioned in the remaining part. However, sometimes the problem is casued that you are not using the program properly. That's why we still write down this part. Please follow these instructions. Alternative software will not gonna make any difference lf the problem is something else. Step 1 : Download the latest version of Rufus Software. And right click on setup file. Open the desktop shortcut and run as administrator. IMPORTANT - To check ISO file is corrupted or not. Use 7Zip software and extract it. If not any error comes while extracting. Then, the ISO file is completely OK. And if an error occurs, then you need to download the file again. Step 2: Select USB device and ISO file in Rufus, and click on "start" button. Step 3: Before booting the USB drive in any computer, you need to set boot order or boot priority from BIOS settings or boot menu. You can find out many guides about this online. Not seeing or detecting ISO file. Rufus is an open-source application for Windows, being used to burn and create bootable USB drive. But this software fails sometimes and is only limited to Windows, not available for Linux and Mac OS. So, here are some Rufus Alternatives. If you don't like to go through multiple options. Just want a simple software, that can create the bootable drive with few clicks. Then, Etcher is the one, which you're looking for. Like Rufus, Etcher is also free and open source software. Also, it's cross-platform software used for burning images. Step 1: Download Etcher from the official site of it. Note: It's available for 64-bit and 32-bit operating system. So, please check your system type first. To check, right click on "My Computer", and then click on properties. And, if you're Linux or Mac user. Then scroll and at the end of the site page. You'll able to find out download links. Step 2: Run Etcher setup file, and it will hardly take a minute to install. When installation will get complete, the software will open automatically. Step 3: The software interface is completely user-friendly. With the only 3-5 clicks you can actually start the process. Click on Select Image option. And, then choose ISO file. Step 4: Connect USB Drive and software will detect automatically. If using multiple USB drives, then "change" option will might helpful. Etcher comes with validates flashing feature, which will resolve "device isn't booting" problem. Although, you can turn it off from settings. Apart from USB Drive, you can also flash SD Cards. But you need a card reader for it. That's why Etcher is one of the free alternatives to Rufus. 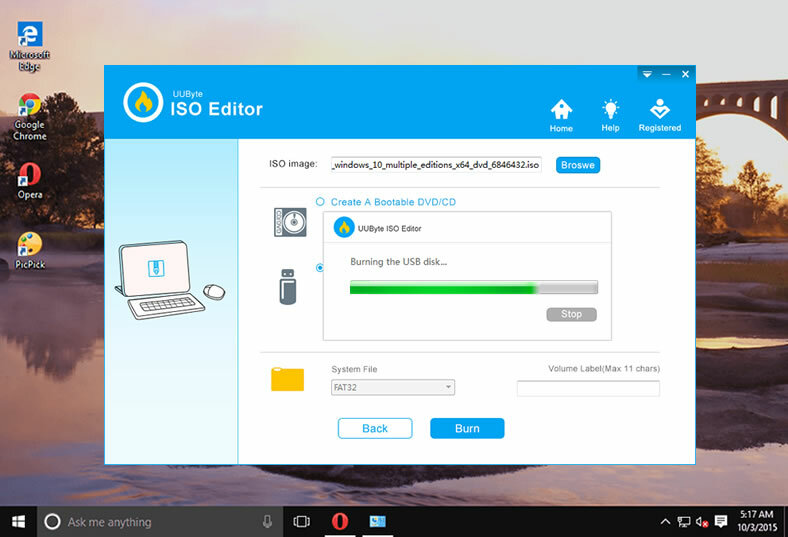 If you're the one who likes to use CD/DVD drive; then UUByte ISO Editor is the perfect solution to replace Rufus. Though this software isn't cross-platform, but it works in all versions of Windows, including Windows 10, Windows 8.1, Windows 7 and Windows Vista. 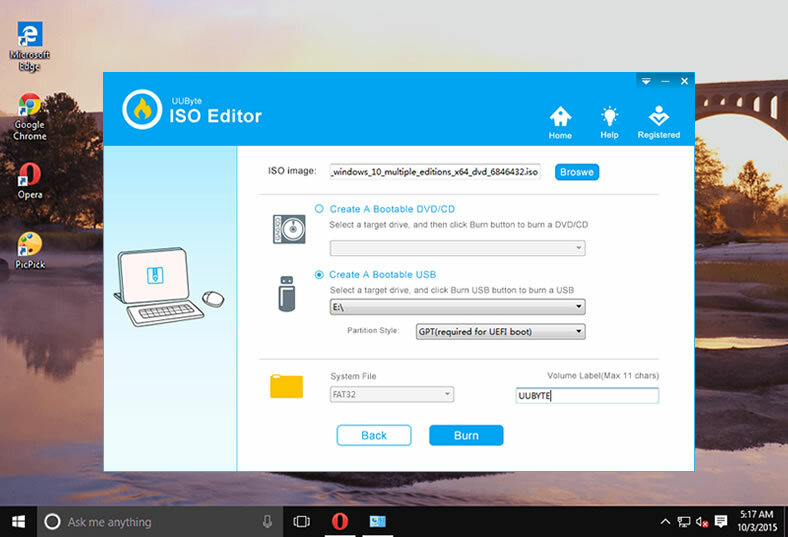 In addition, the latest version of ISO Editor supports two partition style: traditional BISO and UEFI. Reliable with less errors . Support most of USB and CD/DVD manufacturers. Simple to use with user freindly interface. 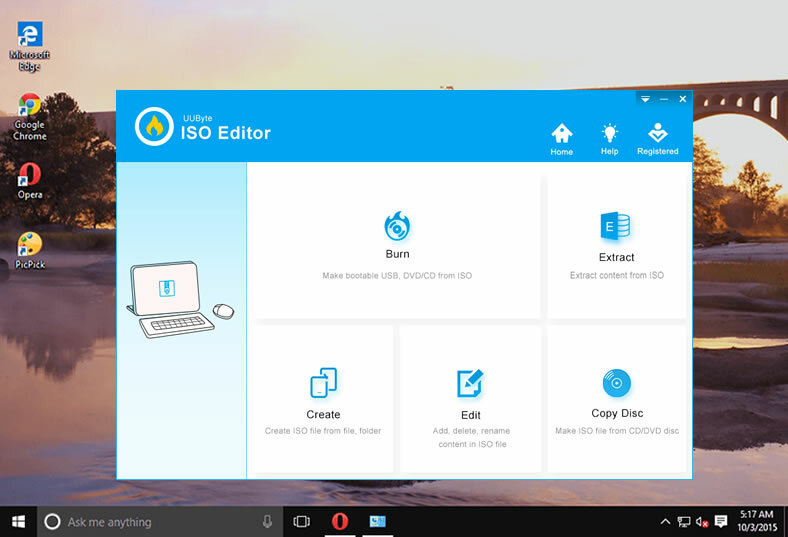 Additional ISO toolkit for ISO creation, editing and copying. Go to the official site of UUByte and you can download the software from there. The installation process is quite easy. Simply run the setup file and install it like normal Windows software. After completing the installation process, open software from the computer. Use "Browse" button to select ISO file. If you want to burn DVD then select "Create a bootable DVD/CD option". Else, by default bootable drive option already selected. You just need to connect your drive. 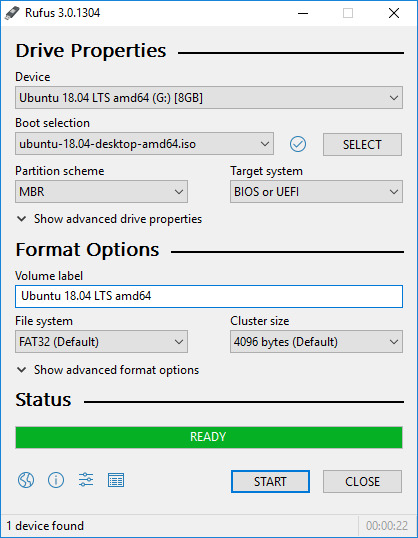 Now, you should to select Partition style. And, enter a label (name of bootable drive) if you want. After that, just click on "Burn" button to start the process. The software claims to create almost all manufacturer drives into a bootable drive, even SanDisk, which many software isn't able to do that. Also, it supports all kinds of DVD and memory cards. So, if you create too many bootable DVD, and want this software feature. Then it is worth trying out. 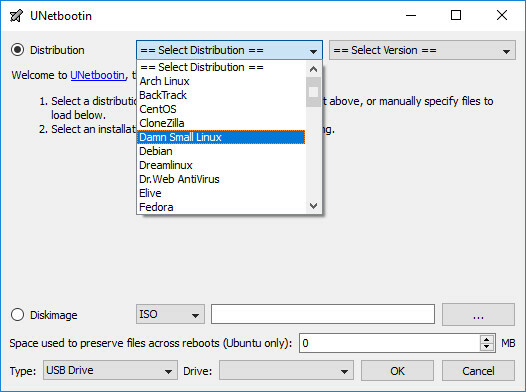 UNetbootin is one of the perfect free alternatives to Rufus. Unlike Rufus, you don't need to install it. You can simply run it and start using it. The best feature of UNetbootin is, it saves your time. If you don't have ISO file, then you don't need to look on the Internet. The software comes with distribution option, which allows you to choose from multiple OS. However, option to download Windows ISO isn't available, only Linux is supported currently. So you need to download ISO file from Microsoft site if you didn't have the ISO file at hand. Step 1: After Downloading UNetbootin, run it as administrator. Step 2: If you have already an ISO file, simply select the "Diskimage" option at the bottom. And then add the ISO file to the program. If not, then you should choose one from Distribution drop-down list. However, only Linux distro is available. Step 3: From the "Type" tab, please select USB drive as the media type and choose the correct drive name. When everything is set up properly, click OK button to start the burning process. That's it. These are the best paid and free alternatives to Rufus. Some sites will suggest you more alternatives. But, don't get confused; these alternatives are more than enough.